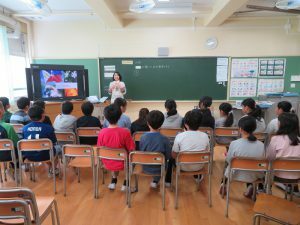 ASEAN-Japan Centre conducted a school-visit to Hikarigaokaharunokaze Elementary School. 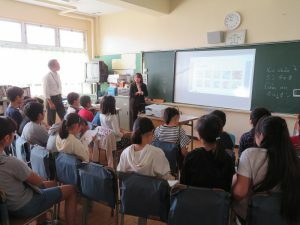 In the school-visit program, Cambodian, Filipino and Vietnamese nationals living in Japan introduced their home countries to the 4-5th grade students. Each lecturer used photos and movies to introduce their home countries. As the lecturers had good knowledge of Japanese culture, they presented their countries by comparing them with Japan. For example, the lecturer explained that the period when Angkor Wat was established was in Kamakura period in Japan and the difference of color of bills in ASEAN and Japan. A Cambodian lecturer explained what the Angkor Wat means to Cambodians, and other lecturers talked about the typical school life of elementary school students in their home countries. The students said that they admire the elementary school students in ASEAN who are eager to study and help their families after they return home from schools.